Natural wood flooring is a beautiful and durable addition to any home that can potentially last generations. It brings elegance and convenience together as it is easy to manage, and people tend to feel more confident in the cleanliness of wood flooring. Wood is a natural, customizable, and durable option for any lifestyle. There are, however, several reasons you may need to refinish or resurface your hardwood floors. Brucke Flooring provides experienced floor restoration work for all of your Tulsa flooring needs! Certain areas in are more likely to become faded and damaged from common activities. After a while, all of those parties, get togethers, living rooms dance sessions, and back and forth trips for groceries begin to show. Scrapes and scratches can occur from being too rough on wood flooring, but also from the simplest of things that wouldn’t normally be considered destructive. Moving appliances, dropping something on accident, pets’ untrimmed nails, and even contact with something as small as a stiletto heel can put dents into wood. Likewise, if there are no cushioning pads or felt on the bottoms of your furniture, any movement can scratch up hardwood floors. Many hardwood floors are treated with polyurethane to be somewhat water resistant, but it doesn’t make your floors impervious to excess moisture. Wood is porous by nature, so if you don’t dry your floors properly after a spill or mopping, the boards will become discolored, stained and warped. Too many liquid mishaps can lead to cupping and sometimes mold buildup underneath the floor. Although they are fairly low-maintenance, if hardwood floors are not cleaned regularly, grainy substances like dirt, pet litter, or small debris from outside can collect and scratch floor surfaces. Placing a doormat at every threshold can keep outdoor elements at bay, but without regular cleaning it will begin to lose its protective coating much faster. Accidents happen. Animals and kids are prime examples. Messy accidents must be cleaned up promptly as wood soaks up stains and odors if they remain for too long. Determine what type of repair is needed for your wood flooring depending on the damage-level. Whether you are doing repairs yourself or hiring a professional, it’s important to know what the job is. Surface wear and tear can be gently refinished to maintain the wood’s original integrity. Resurfacing is reserved for more extreme mishaps. Refinishing hardwood is a simple and easy option for property updates. The process requires removing all objects in the area and plastic-wrapping vents and such to keep dust at bay. The floor is sanded multiple times: Coarse 30-40 grit sandpaper removes existing stains and treatments. The dust is vacuumed up, and color-matched wood filler patches holes or scrapes. In most cases, a medium 50-60 grit sandpaper and vacuum is next, followed by a final sand with fine 80-100 grit paper. Vacuum once more and remove dust completely with a damp cloth. Before a finisher, buff your floor with 120 grit sandpaper to smooth it over and apply conditioner. Brush stain onto the outer edges with a paintbrush and use an applicator for the center. Prevent air bubbles with slow, smooth strokes. Some damage is irreversible and calls for a full resurfacing. This involves replacing parts of the floor from nails to entire sections of wood. If the damage is too extensive your project should be done or consulted by a professional. Once repairs are made, refinish as usual. If your wood is not treated, you can skip straight to buffing with the 120 grit paper. Repairing hardwood floors can be a pricey investment, but it’s one that helps your wood flooring withstand the test of time. If you’re selling your home, consider the value that well-kept natural wood flooring adds to the property. If you’re a recent homebuyer, this is an opportunity to give new life to your hardwood floors and to your home. Contact Brucke Wood Flooring in Tulsa, Oklahoma today and let our capable and knowledgeable staff assist you. Brucke Flooring prioritizes the highest quality hardwood flooring. 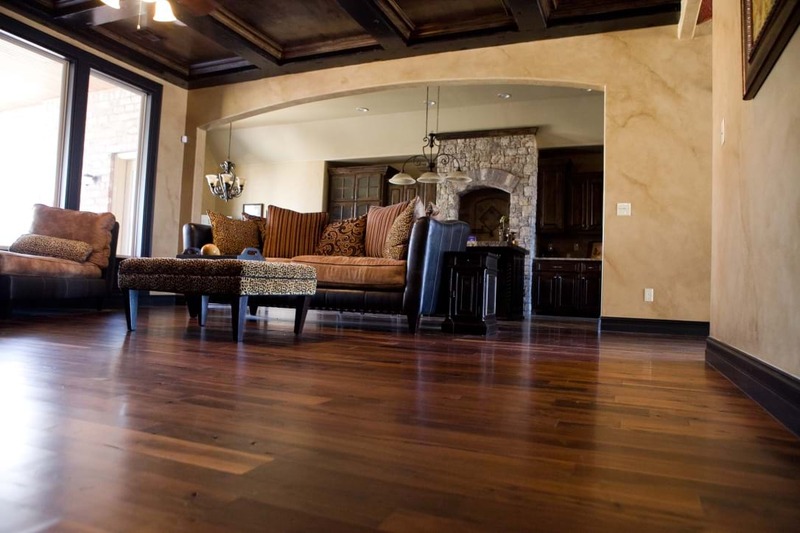 If your home is in need of professional hardwood flooring services, contact the Tulsa flooring experts today!